Sugared Ink: Pack your Flip Flops! Hot off the press brand new wedding invitation design now available! I'm calling it the Island Getaway. 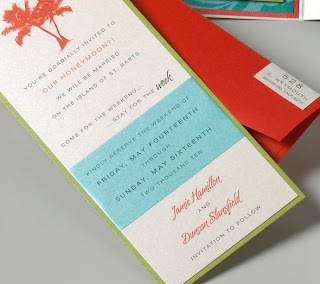 It starts off with a so cute Save The Date that features the wording, "You are cordially invited to...our honeymoon?" Then comes the gorgeously festive pocketfold invite. 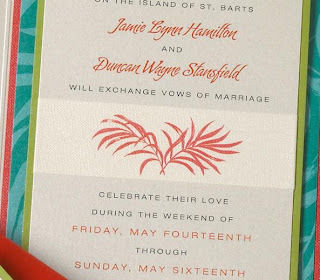 featuring palm frond patterned cardstock (it's shimmery!). 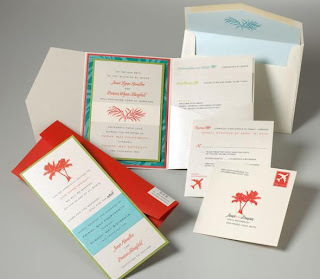 All of your wedding details are tucked neatly inside the pocket. 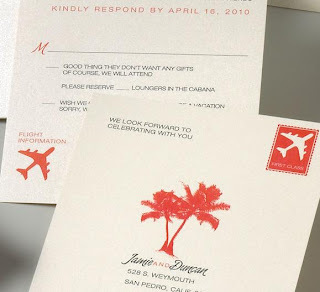 Your guests will being rushing to rsvp so that they can start packing their flip flops and sunscreen! It's cold outside right now, but this invitation sure warms me up! Color & design can change to fit your event's style. This invitation is available for purchase at our Etsy store here.